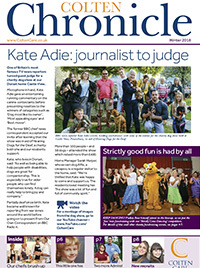 Welcome to our winter edition which has a focus on some of the many ways we engage with our local communities and fundraise for charities. We are excited to be highlighting the forthcoming opening of Bourne View in Poole, our 21st home, and how we are already supporting our neighbours in the community there. On fundraising, we explain how residents at all our homes have been getting involved with initiatives such as Children in Need and the annual Macmillan coffee morning. These are great social experiences providing lots of fun, quite apart from the aspect of charity support. You will see that we are preparing for the launch of the 2019 Colten Champions following the success of the inaugural awards. I encourage you to have a think about who you would like to nominate ahead of the call for entries opening in January. I am delighted that we have rounded off the year by winning the Company of the Year title at the Solent Business Awards. What is especially pleasing is that we were up against many different kinds of businesses, so our success is a real vote of confidence in the care home sector. As well as the Chronicle you can receive information on individual homes by joining the mailing list for our quarterly community newsletters. Please speak with your Home Manager, or send an email to marketing@ColtenCare.co.uk and we will add you to the list.